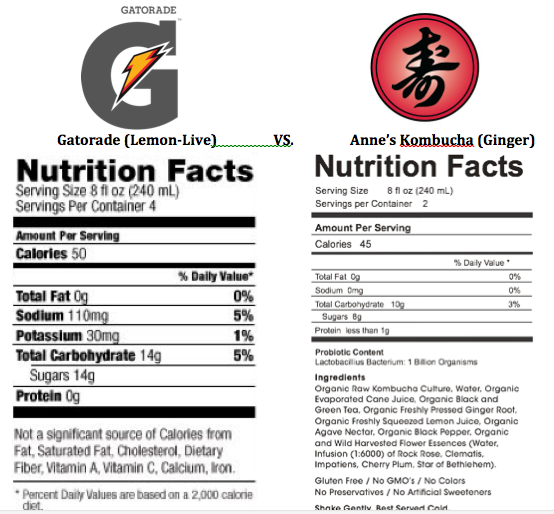 1965, Gatorade has been the revolutionary “sports drink” for athletes around the world. What you may not know is that Kombucha has been around since the Tsin Dynasty (221 BC) and was said to have magical powers enabling people to live forever. Although that isn’t true, it is valued for its harmonizing effects on the body and soul. Both of these drinks have been around for a while and give many benefits to people today. 1. 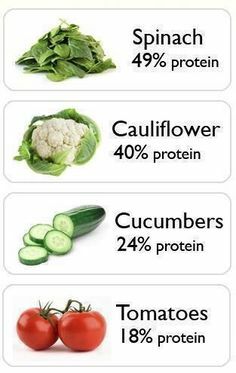 Yes, it’s acidic (3.75), but it turns alkaline in the body, just like lemon juice or apple cider vinegar which is highly beneficial since disease such as cancer, viruses, pathogens cannot exist in an oxygen-rich environment. 2. 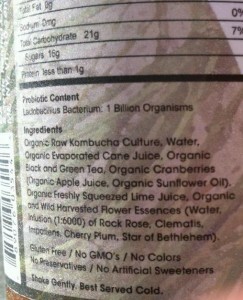 Kombucha is at 0.004% which is considered Non-Alcoholic. 3. As far as allergic reactions are considered, anyone can be allergic to anything. However, we have never heard a case where anyone was allergic to Kombucha. It’s been around for over 2000 years. 4. 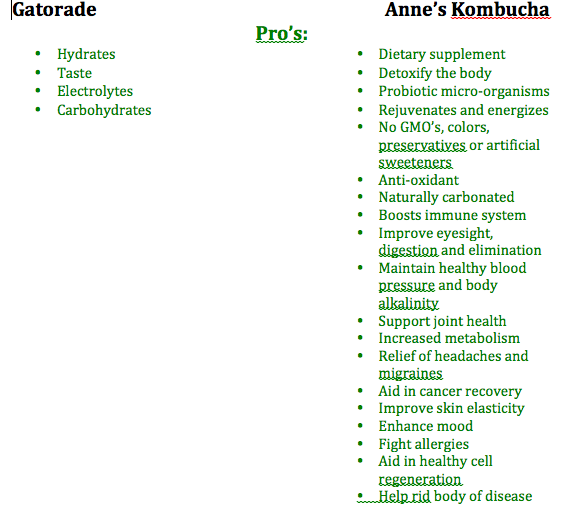 Yeast and Bacteria to some may seem like a con, but it would not really be a “Con” if you are looking for the types of benefits kombucha gives. These are friendly bacteria and yeast that work together in perfect harmony to metabolize the sugar and caffeine to grow and the by-product is the healthy beverage we’re consuming. Under “Pro’s” it’s gluten free, vegan, as well as GMO-Free, etc. that we have already mentioned. Anne’s Cranberry Lime Kombucha is made by hand with the finest organic ingredients and flower essences as shown in this picture above. Notice how every ingredient is organic. If this drink was made using sugar instead of cane juice, the final product would not have been the same. 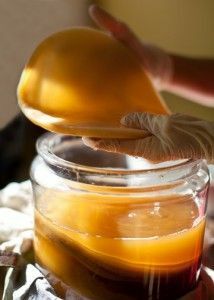 The Kombucha mushroom, a fermented yeast enzyme tea, is thought to originate in Asia during the Chinese Tsin dynasty in 212 BC. This Eastern Tea was referred to as the Remedy for Immortality or the tea of Immortality. With the extension of trade routes it spread to India and Russia through travelers and traders. Kombucha resurfaced in Japan between the Wars after a Japanese visitor to Kargasok (Russia) found this fermented tea drink responsible for their astonishing health, longevity and well-being. A Korean physician may have introduced it to Japan by the name of Kombu around 415 AD. 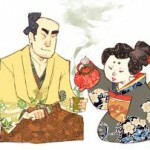 Today the tea – once routinely used by Samurai – is widely used again in Japan. Kombucha appeared in Germany about the turn of the century from Russia. The fermented tea drink became quite popular across Europe until World War II with the shortage of tea and sugar. For hundreds of years a tea has been made from Chaga (a birch-tree mushroom) by the Russian peasants of the Alexandrov district near Moscow to cure cancer. 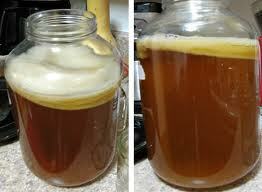 There is speculation that the Kombucha mushroom is related to the Birch-tree mushroom. People in Russia have a long tradition of using a healing tea called “Tea Kvass” made from a “Japanese Mushroom”. From Russia it spread to Prussia, Poland, Germany and Denmark. 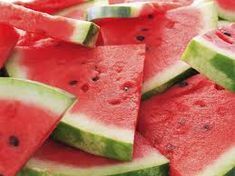 Today it is known and consumed around the world for its extraordinary health benefits. 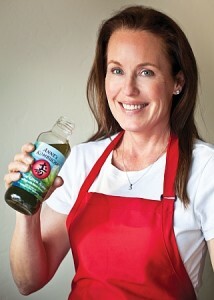 Anne’s Kombucha is a raw, freshly brewed, naturally effervescent fermented probiotic drink made by hand from sweet tea and a Kombucha culture known as a “Scoby” (Symbiotic Culture Of friendly Bacteria and Yeast). The culture is alive and is a co-dependent blend of healthy bacteria, yeasts and other microorganisms. 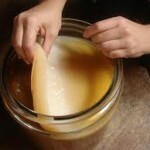 Scoby is also referred to as a culture, mother, and baby. Although there is little published research on Kombucha, the fact that it is still here today after 2000 years is a testimonial in itself and that millions of people throughout the world have found it to have great value for it’s amazing health benefits. 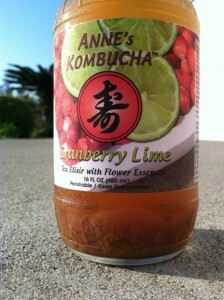 Check out Anne's Kombucha drinks at www.anneskombucha.com.